Tinsel is a Nigerian soap opera that has stood the test of time. 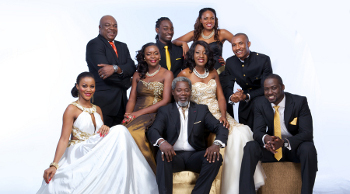 It is not surprising that it is regarded as the most successful of television drama of Nigerian television. The plot of this drama series revolves around rival film production companies: Reel Studios of Fred Ade-Williams (played by Victor Olaotan) and Odyssey Pictures of Brenda Mensah (played by Funlola Aofiyebi-Raimi). Events, however, have increased the rivalry to include to Include Phoenix Prime since Brenda left the Odyssey Pictures ship to start a fresh sail as captain of Phoenix Prime. Tinsel stars some of the best actors in the Nigerian movie industry and Tinsel has quite more a number of actors such that they are subcategorised into cast and day players. In fact, sometimes, celebrities from other aspects of the entertainment industry grace our television screens as visiting actors on Tinsel. The likes of Victor Olaotan, Iritiola Doyle, Funlola Aofiyebi-Raimi, and Gideon Okeke are only few of the abundance of talents in our favourite soap. The thrilling television series has leading experts in the industry as members of its production crew. Tinsel, which began airing in 2008, was created by Yinka Ogun who is also a member of the team of writers. It has also had brilliant directors like Tope Oshin and Alex Mouth. As earlier mentioned, Tinsel has been around for a while that it almost seems to be a true part of life. The Tinsel community feels like an actual town probably in the south-western part of Nigeria where everybody knows everybody and this is even more so with the emergence of real life marriages from the soap. Lovely, I know! Tinsel characters are robust and fully developed such that a viewer can, after some episodes describe the personality of each character from their clothes, to their make-up and language use. For instance, a viewer can guess that Brenda loves colour red and can even tell if a pair of shoes belong to Amaka or to Sheila. It is important to mention how significant it is that the characters are made to repeat their clothings, wearing them in different ways, pairing an old item with new ones: it all points to the thought and attention put into the soap. Also, the characters are very plausible and easily relatable. They have different layers like actual real life people who have different levels of challenges. It is not out of place to say that the extent to which each character has been developed is directly proportional to the number of fully fully developed subplots. There are many developed stories and sub-stories in Tinsel such that even at over two thousand and four hundred episodes, there are still many more episodes to come because the stories just keep unfolding. Have I said how much I appreciate the commitment of the cast to deliver their lines with grace and talent? I think English is the Mother Tongue in Tinsel Town. Everybody, regardless of socio-economic status, speaks fine English. It is true that the elite employ elevated language and an impeccable choice of words but even Cosmos makes grammatical sentences. One could go on and on about Tinsel and how satisfying it is to watch the sharp and clear moving images and hear every sniff and whisper clearly without getting tired. Yes, It is that good. There’s just one thing that viewers may find disturbing. The make-up artists on the set do such a great job creating colour schemes and profiles for each character but I feel bad sometimes looking at how widely open Sheila’s pores. I think the crew should pay more attention to the skincare of the actors. Also, the settings and locations could be increased to include bars that aren’t Ziggy’s, Talk shows that aren’t the Juice with Peju. I’m sure someone understands this. If you’re yet to join the Tinsel train, you’re only two thousand four hundred and fifty-six episodes late. But again, it’s better late than never. Tune on Weekdays at 7:30 pm on DSTV, African Magic Showcase Channel 151.